The chapter starts with a quick recap of the last chapter, with Athena being captured by Pisces Aphrodite and taking her to the Sanctuary, Shoko was unable to do anything to stop such event. Meanwhile Mayura is still fighting against Katya, Ewan and Georg. Katya recognizes that Mayura has won the fight, but they won the war! Because they were just buying time and now… Athena must be with the Grand Master! Mayura is impressed by such events, and especially that Katya was not ignorant about the fact that Saori Kido is in reality Athena. The Corona Borealis Saintia apologizes to both Ewan and Georg for dragging them to this, the Silver Saints are impressed by such things. Katya then decides to end her own life for her sins, but Mayura stops that from happening by making her unconscious. She grabs Katya and tells the Silver Saints to go back to Sanctuary and tell everyone that Katya died in service or something... Leaving them alone. Athena has woken up from a nightmare, when she was a baby and the Patriarch tried to kill her. She quickly can recognize that she is in Greece now, a voice is being heard and she can recognize the man in front of her as the Patriarch, the Grand Master and leader of the Saints. The Patriarch is crying and Athena wonders why, the leader of the Saints tells her that he is so sorry for all the crimes he has done, all the sins he made, and in order to stop doing more sins, he wants her to end his life since he can´t kill himself. Athena denies such request, since she understands that the Patriarch made a mistake, he tried to kill a Goddess, but she can see that there is good inside of him, and instead of killing his life, he must take that burden and live with it and try to get redemption through his future acts. After such words the Grand Master´s hair starts changing and start saying that Athena is such a fool, she had the opportunity to kill him and now it´s to late! He will take her life now! The Patriarch prepares the dagger, while Saori wonders what happened to the man that was in front of her? Suddenly his hand is stopped and it seems an internal conflict is happening inside the Grand Master, which uses his technique of opening a pocket dimension and puts Athena in there, to safety. One side of the Patriarch tells the other that he will not let him put a hand on her! And that his ambition of becoming a deity is both foolish and impossible! The evil side of the Grand Master says that he won´t stop, not now not ever! Athena is inside that pocket dimension until Pisces Aphrodite comes, he has been ordered to retrieve her and take her home safely. With care he takes her to the Kido Mansion. There the Gold Saint questions Athena in why she didn´t killed the Patriarch when she could? He says that she is truly naïve since the human being is violent by nature, so there will always be war, and the peace is attained by such wars and firm grasp, therefore the powerful is the one with justice at hand, and by not killing the Grand Master, Athena has shown that she is not powerful, nor is in the side of justice…For that, he has decided to side with the Patriarch. Seeing that he has spoken more than he should, Pisces Aphrodite apologizes himself and decides to leave. He still is wondering how Athena will grow and what will be her resolution when this war between her and the Sanctuary starts. A little in the future, Ewan and Georg are still in Japan, they are on their civil clothes and reading the newspaper, they now know that an incident has happened in the Galaxian wars, an unknown person calling himself “The Phoenix Saint” caused a ruckus and alongside his underlings has stolen some parts of the Sagittarius Gold Armor, therefore the Galaxian Wars are put on hold. Back in Japan, the group has received notice about the destruction of the Saint Academy, Erda has reported it. The war against the Sanctuary has started and has already claimed the souls of the student, including children that still weren´t able to fight and stand by themselves. For that, Saori has decided to give some time off to the Saintias, she will be encountering alone this menace, Shoko comes and tells her that they are supposed to be a team! They are ready to fight against any enemy that dares to treat Saori! 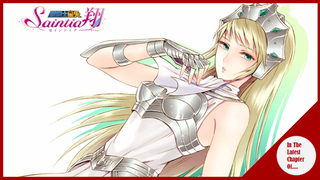 Still Saori won´t budge she is set to not to put her Saintias to anymore danger, suddenly a female Saint appears…Aquila Marin, she trained Pegasus Seiya back in Greece, she says that if they think they can handle the Silver and Gold Saints from the Sanctuary… She will test them in battle. Meanwhile Mayura´s students have gone to see Mu, the man who can restore armors. Back with the Saintias, Mii, Xiaoling and Shoko are having a hard time dealing with Marin, the Silver Saint of Aquila is very disappointed in them and tells them that if they are going to fight like that, they should stop being Saints and just become maids at the mansion, they are better fit for that after all. Shoko gets up and attacks Marin! Marin can see that Shoko, just like her disciple, is someone who attacks with brute force without thinking too much; she can see the fire in her eyes and ask for her name, after recognizing her as Mayura´s disciple… She now understands. Marin attacks with the Meteor fist! She says that this is a simple technique were punches are thrown at high speed, and whose power will depend on the cosmo of the user, so it can be either too useless or too powerful, such direct attack can be in sync with a headstrong type like Shoko. Meanwhile Katya has been healed by Mayura and is ready to leave. All the while, the Silver Saints have gone to Japan… By fate, Saori was always protected by a Bronze Saint, these young men at that time didn´t believed or cared if Saori Kido was Athena or not, but they won´t let a defenseless person be killed in their presence. Meanwhile the training with Marin has been exhausting for the Saintias, still they now believe that this time off was because Saori believes in them, she believes that they can get better so in the near future they will be at the front line with her, fighting with all they have! Marin appears and she has something for Shoko, the Equuleus armor has been restored, Those disciples of Mayura went over the top in order to restore it. Meanwhile near Sanctuary, at what it remains of Eris temple, the souls of the deceased, those violent deaths that have happened by conflict, especially the one between Athena and Sanctuary, are gathering there, praying for a new divinity, or rather the return of it, Mayura can sense such danger and that these souls might as well call Eris name and bring her back. The time has passed and one night, at the Kido mansion, 3 unexpected guest have appeared… Silver Saints who were killed by the hands of Seiya and the others, now reborn as Ghost Saints. Tatsumi was ready to fight until Shoko and the other Saintias appears and show their new strength after training with Marin by quickly defeating the past Silver Saints! They have the power to fight alongside Athena again! The conversation was going nowhere until Andromeda Shun, one of the Bronze Saints who participated in the Galaxian wars and has been protecting Saori against the Silver Saints has appeared, he calms the Saintias by telling them that he will go and protect her, he believes in her, that she is Athena, and he is sure that Seiya and the others believe it too, so she won´t go alone… So he tells the girls that they can trust them, they will give their life for Saori… For Athena. After such conversation he leaves and Saori has one mission for the Saintias, to destroy the evil spirits looming in Eris temple… Before leaving Shoko makes a promise with Saori, to get back, with safely so they can hang out and chat in peaceful times. The group has reached Greece, accompanying Saori there are: Pegasus Seiya, Dragon Shiryu, Cygnus Hyoga and Andromeda Shun. The messenger of the Grand Master has appeared and he reveals to be the Sagita Silver Saint who attacks Athena! An arrow has hit her heart, still her Cosmo is prohibiting to end her life so soon, but in order to remove safely this arrow, the Bronze Saints need the assistance of the Patriarch, they have 12 hours to reach him, crossing the 12 Zodiac temples; the most heated battle for these youngsters has just begun. A lot of mixed feelings on this chapter, especially negatives… But let us start with the good things, so I can start ranting about what is one brutal flaw of this chapter and a whole character destruction in less than 10 seconds. The good thing is that they slightly touched the whole deal with Ikki and the Silver Saint attack that Seiya and company had to fight, which is something nice. Another good point is the “anime original” part of the attack of the new Ghost saints in the form of already deceased Silver Saints, including Dio (Get it?) which were quickly defeated by Shoko, Mii and Xiaoling, thing that was good since it showed us the progress the main characters have with the training that they put up with Marin, so they, just like Seiya and the Bronze Saints, can now deal with the Silver brigade and getting close (if not equal) in power… Having said that, here it is the bad things. First is the animation, while the past chapter had it too, at the very least it got most of the pictures shown beautifully, this time is not the case at all! Most of the drawings were straight up ugly, but that is the least of my concerns… The big one, and the one that really put my blood boil is how they treated the character of Erda… Some spoilers ahead. In order to understand, Cassiopeia Erda is the 5th Saintia and her whole character arc and motivation is tangled with the whole Saint Academy destruction and her hate towards Death Mask, so cutting such vital point in a character development, especially a main one it´s not good, I mean I know they are rushing things because they want to put attention to the goddamned fight between Milo and Aioria Vs. Eris new toy; but cutting such thing is not respectful to the character, it is not respectful to the story and it feels like a middle finger to the fans of Erda! This is more glaring because Erda´s participation is halted until the end of the third story arc (we are on the second one) and the character starts to shine until the 4th one, so cutting pretty much the whole participation of a supposedly main character in what this whole anime will cover is just insulting! Like if they are going to do this, Why bother with the character at all? Just cut her off! I mean in Erda we had a an awesome no BS female that was fighting her own inner rage in her impossibility to defeat (and then kill) the person who destroyed the Saint Academy, and how she have to make amends with that reality plus the fact that she doesn´t actually wanted justice, but revenge was her motivation , but now that such pivotal point of a character has been cut off in order to rush things… Man that was a huge mistake since they are pretty much killing any interesting thing of a character, now Anime Erda is just a chick with a bike, and that´s it… Just like that they made a Main character totally useless and irrelevant for the story at all! And I know that they can add some scenes in later chapters or make Erda killing “in a badass” way some no-name Dryads just for us to make like we will care about a glorified extra like how they transformed her now, but what would be the point? The moment was now! And they just decided to pass it as a non-important event! Man I actually got angry and I pretty much doubt that we will see anything of significance with Erda, the only good thing is that next chapter the eye catcher will be of her, but that´s about it.